Performing musicians are constantly seeking out ways to amaze their audience while reaching new levels of musical expression. 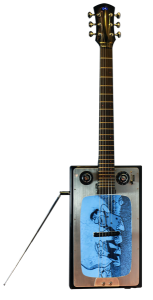 The Video Guitar is a radical new way to perform and interact with the audience by adding high resolution video and graphics to the face of your guitar. The possibilities are endless. With the simple push of a button your guitar is transformed into one of the most visually outstanding instruments to ever reach the stage. Featured guitars are examples of custom Video Guitar orders. Please contact Visionary Instruments to learn more and start building your custom Video Guitar today.